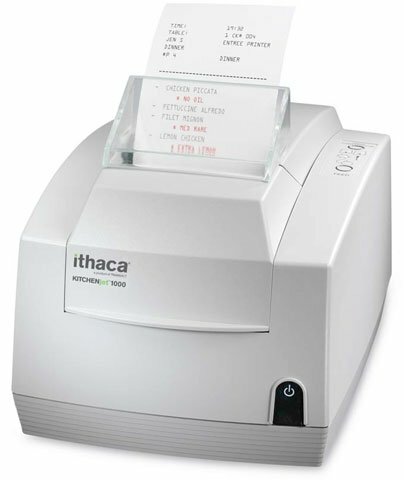 Ithaca KITCHENjet 1000 - Inkjet, two-color, receipt printing, 12 lps, 25-pin Serial interface. Includes auto-cutter & power supply. Order cables separately. See accessories. Color: white. Meet the Ithaca KITCHENjet 1000 inkjet printer. The kitchen environment is a hot, messy, demanding one. You asked for a reliable printer that would thrive in that world. You wanted high heat-resistant cabinetry. A loud buzzer you can hear above the chaos. A protective shroud that wards off spills and spatters. Stainless steel wall or countertop shelving for flexible positioning and even more heat protection. A wireless option. Your order is ready: the KITCHENjet 1000 is here. Complete with 12 lps print speed, our Insta-Load automatic paper loading system, extra large paper roll, and PowerPocket for secure storage of the power supply. All backed, of course, by Ithaca's solid reputation for top quality and reliability. The Ithaca KJ1-S-2-25 is also known as Transact Ithaca	ITH-KJ1S225	or KJ1S225	.